201 place | Vector illustration in rank M-rank: Collection of little piggy. A variety of little piggy design. 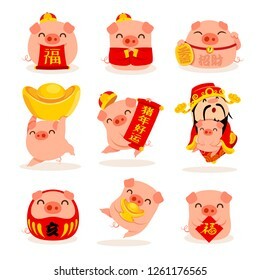 Translation: (scroll) Good luck in the year of the pig. (scroll) Good Fortune. Collection of little piggy. A variety of little piggy design. Translation: (scroll) Good luck in the year of the pig. (scroll) Good Fortune.